LANSING — With 104 long-time leaseholders seeking an extension of their right to keep hunting and vacation camps in the Ottawa National Forest, the Senate wants the federal government to grant them a reprieve. An extension also has backing from a Western Upper Peninsula filmmaker whose new documentary highlights the history and traditions of the camps and the dispute over their future. U.P. 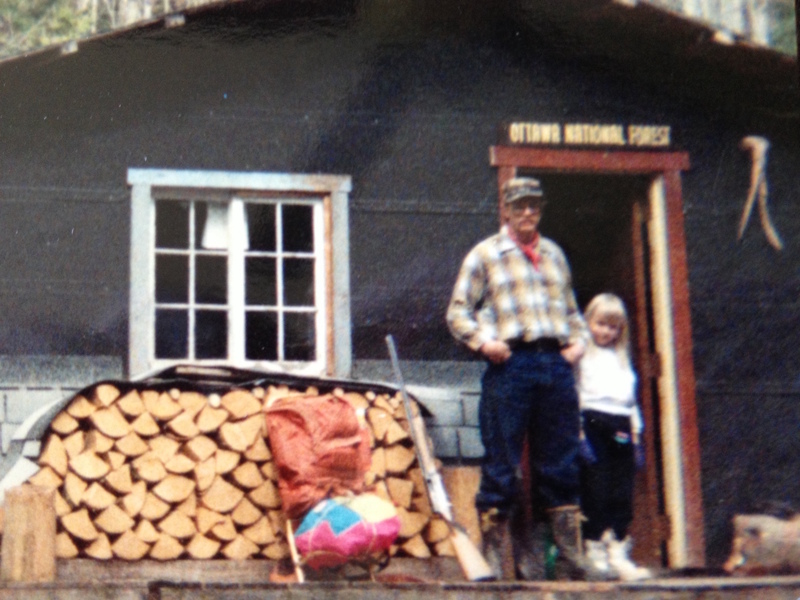 filmmaker Kristin Ojaniemi as a child and her father, Armas Ojaniemi., in front of the family hunting camp in the Ottawa National Forest. Courtesy photo. But the U.S. Forest Service says the law is clear that the leaseholders — who signed non-renewable 25-year agreements to abandon their one-acre lots by Jan. 1, 2017 — must leave. By then. Several dozen have done so in the past quarter-century. The leases — signed when the Upper Peninsula Power Co. owned the land and before it became part of the national forest — require them to take their personal property and remove any buildings they’d put up within 90 days after the deadline. If they don’t do so, the Forest Service will probably dispose of them, and it “may be costly,” said Randy Charles, Ottawa’s staff officer for operations. Some leaseholders have been using the sites since the 1950s. About 60 percent of the sites are along rivers, and the rest are inland lots. None are lakefront and none are in designated wildernesses, according to the Forest Service. Lease payments of $366 a year provide about $35,000 annually to local townships, not to the federal government. Leaseholders collectively also pay almost $10,000 a year in property taxes to Ontonagon and Gogebic counties. The Senate has unanimously passed a non-binding resolution asking the Forest Service to grant special use permits to current leaseholders under the federal Recreation Residence Program. Resolutions express the opinion of the Legislature but have no legal effect. In part, the resolution says the cabins are often left unlocked and can provide refuge for people stranded in the forest during “occasionally harsh and unexpected shifts in weather conditions,” such as a Boy Scout troop that sheltered at a camp after getting caught in a storm. Sponsors of the resolution include Sens. Tom Casperson, R-Escanaba; Darwin Booher, R- Evart; Goeff Hansen, R-Hart; and John Poos, R-St. Joseph. Casperson’s legislative director, Kendra Everett, said his office got involved at the request of constituents. There are thousands of recreation resident permits in national forests elsewhere in the country, but the Forest Service hasn’t granted any since the 1970s, according to Charles. But Kristin Ojaniemi of Paynesville has a different take on the issue. On Oct. 17, she premiered “Up a River,” her film about the controversy, at Ewen-Trout Creek High School. She visited about 30 of the camps in the two-year process of making the documentary. She’s entering it in film festivals and will have additional showings Nov. 7 in Bruce Crossing and Nov. 13 in Ontonagon. In the mid-1980s, her father built Woodtick Camp on a leased plot about three miles north of Bruce Crossing and about 200 yards from the Middle Branch of the Ontonagon River. In addition to the film, Ojaniemi is leading an online petition drive to save the hunting camps. What will happen if the Forest Service doesn’t reverse its decision? And that’s what should happen, according to Marvin Roberson, the Sierra Club’s forest policy specialist. He said the Forest Service is doing the right thing, adding that the Legislature lacks authority over federal land. “When you sign a contract, you shouldn’t run to your friends in the Senate,” Roberson said.